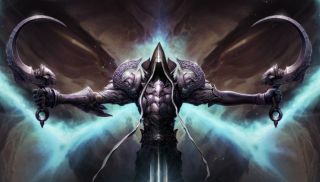 The heroes of Diablo 3 are preparing for the ultimate battle against the Angel of Death, and their terrible quest calls for blessed new powers. Those powers come in the form of mighty destructive abilities, like Vengeance, Epiphany, and, er, Piranhas? Yes, for all the bombast surrounding this new Reaper of Souls trailer, never forget that it's a game in which you can summon a pool of flesh-eating fish to deal with your enemies. Reaper of Souls is out next week, and - along with the added powers, the Crusader class, and Act V story - brings Adventure mode, in which the player must complete Bounties and randomised Nephalem Rifts. For more on the expansion, check out Tom's hands-on preview .